Pros: I have been using RetailEdge POS since 2014. Glad to say that I'm very satisfied with this software. It's very easy to learn if one can commit just 1 to 2 hours for one week when newly bought. The functions provided are certainly worth more than the price tag of this software (I'm not kidding). The function buttons and menu items are easy to navigate and after a few tries, it becomes natural to navigate. When compared to other competing POS software which may look more colorful and user friendly at first, they sell functions which are already included with RetailEdge as add-ons. A good example would be RetailEdge's gift card function, membership function, cupon function and many more. With the other software, you will end up paying for each add-ons and the final cost of owning that software can be quite costly. I have been persuaded by many firms that want me to switch over to their POS software but when asked if they can give a software that has the same or more built in functions as that of RetailEdge AND at the same cost of RetailEdge, I never seem to get a reply from them...haha. Any software is as good only if the tech support provided is reliable and prompt and the folks at RetailEdge have not failed me once. The tech support cost is again affordable when compared to other POS software. Oh, before I forget, the constant software update provided is simply awesome. You can be assured that you're in safe hands for the long term when you purchase RetailEdge POS. Cons: Not much actually. I just hope that the gift card and membership (points system) functions can be expanded more in RetailEdge POS. These are the only functions I personally feel that has not caught up with other competing POS software. There have been many updates and improvements in RetailEdge pos EXCEPT for gift card and points system functions. If these can be made competitive with other software in the POS market, I'll be happy as lark. Maybe as I write this review, the good folks at RetailEdge are already coding new functions and updates for the above 2 functions....finger crossed. This software constantly grows with our business and there are features we still haven't used yet. Pros: Top on my list is ability to serve multiple customers as they change their mind or go to get something else. I also love the ease of ordering when I generate PO's based on min/max quantities. The ability to have gift cards has been HUGE and one of the primary reasons we got this software. If a customer loses their card, due to extra information we put in at the time of purchase, we can find it and they can still use it. We've been able to easily add on more registers as our business has grown without any extra work being needed. Our customers love the ability to look up past purchases to aid them in their current purchases (to repeat or not repeat what was bought before). We both love the loyalty dollars feature which eliminates the need for punch cards. We also love the ability to do packages of items that we sell in monthly or quarterly specials. There are so many more features. We tell any new business this is THE only software they will ever need! Overall: It is "as advertised" Easy to set up and implement. Easy to use once you figure out the many functionalities (and there are many). We add new customers with ease and can track their purchases and we can advise them of how soon until they get loyalty dollars. We can issue gift cards and track them. 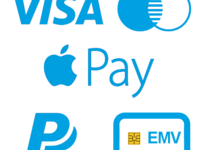 We can give charge accounts if we wish and charge whatever interest and if you integrate your software into your e-mail, bill them monthly (a feature we have yet to use). When entering a new PO and entering multiple new inventory items, I love being able to use the previous items UPC code and the ability to just change item number/description,etc. which saves me a TON of time from having to do each item from scratch. You can add new items on the fly while a customer stands there and the reports! I haven't even mentioned those! We can easily compare month to month, year over year sales. When renewing our insurance policy each year, it only takes minutes to get them the information they need. We also had to file an insurance claim a few years ago and this software saved our butts! We were able to easily look up inventory value quickly. The claims guy said it was the quickest and most detailed claim he'd ever seen! I love that I can put in items sold in multiples and a box will pop up to ask how many. How you can have an unimaginable amount of departments and categories to insure you can pinpoint sales strengths and weaknesses. This software seems simple until you use it and realise that it's very complex and has so many features for the price. The ease of use fools one into thinking it's basic and may not have everything you need. ANY new business that I speak to I tell them about all of the features we use and them any we do not (ability to have touchscreen with pictures, integration of security cameras, ability to use scales and weigh product to sell). Another feature I almost forgot about is to track individual sales people's sales which has been very handy as we pay commission on some things and need to see who sold what at the end of each week. I literally could go on and on and have to tell people when I gush about the software that we are not getting paid to push it. I will admit, it doesn't have the prettiest interface but when you use it, you can appreciate the loud colours and large buttons as you need to find things fast and you can with this software. I spent months researching software. This was our answer. BUY IT! It will not let you down! Pros: The inventory control is wonderful! Can track when your shipments were received, cost averaging, qty on hand and more. The inventory control is second to none in my opinion! Customer tracking is great too! Can see when your customer bought items and how much they paid for it. All customizable too, so it really helps to see which products are moving in the different areas of interest or regions where they live. Customer loyalty program is an excellent addition for our customer base and they love it too! AND reports are customizable so you can see just about anything that is going on with your business right in the system. Before moving to Retail Edge (moved from REGIT after it was discontinued, which we used for almost 10 years), we researched several systems and each had problems or lacked features that we needed. We found Retail Edge and were amazed at all the features listed, and the ability to create custom reports and integrate with certain on-line store platforms. Retail Edge covers everything we needed for our business and gave us plenty of room to grow and expand on the features. Lastly, but most importantly, the client support is absolute excellent. Really never had any issues, but had numerous questions (and sometimes still do) and those tech guys answer our (sometimes stupid) questions quickly, honestly and most of all they are just very nice guys too! You can't go wrong with using Retail Edge! Cons: Well, not much to put here. I would like to see a report that is ran off the tax settings to make it a little easier for me to see what GOVT or RESALE/WHOLESALE customers have made purchases for my monthly sales tax reports. But we created our own custom report in the system and used one of the custom fields in the customer database to mark those customers, so we actually have this report. Just had to do a little custom settings in the reports. Overall: Inventory control and customer tracking, custom reports and more! We have been using RE for over 16 years; in 2015 we switched POS, but 3 mos later were back with RE. Pros: I like the elasticity of the program, and the ease of getting around, as I manage sales, inventory, customers, PO's, receiving, etc. I am fairly functional in the program, yet know only a fraction of its potential. Just a few years ago, we inculcated the use of PO's in receiving, which has been to our advantage. We have full integration with our financial program, which we did not know was a possibility until we came back into RE. The main plus, I think, though, is the great (personable) tech support we have experienced in the past few years. The techs make their program work for the individual business. A few weeks ago I had a challenge with the integration of our online store, and I could hear those guys behind the tech trying to re-create the scenario, and come up with a fix. They usually are able to create an immediate work around, but then they send a ticket to the developers for a suggested change, and sometimes that is seen on a future update. Cons: The least thing I like about the software is a result of the best thing I like...and that is the many windows that remain open in the background. Every so often I take the time to clear the windows, to get me a fresh start. Have Used RetailEdge for Decades! Pros: Able to keep track of inventory, sales, customers with ease. RetailEdge easily links to our Shopify account so inventory stays consistent on all sales channels and is actually affordable for smaller brick and mortar operations like ours. Also able to view the days sales remotely which comes in handy when away from the store and the employees are running things. Customer lists can be exported in different formats and uploaded to mass marketing service providers with just a few clicks. Cons: Some things are kind of cumbersome, and while most things have a 'work around' just the fact we need to use a 'work around' is somewhat of a pain. Having said this RetailEdge is still the best bang for the buck even with those occasional work around's. What's a Pain? - Can't add colors / sizes to a Matrix on the fly without exiting matrix or it causes an error. - Multiple vendors can't be used for 1 item. - Closed Layaways or Open Order's don't say this on receipt. (even though we've gone over it with tech support it still doesn't work). - Would be nice to open a service work ticket which will track customer's items. (we use an open order as a workaround, but it doesn't track the items in for service, or give a due date.) Maybe offer this as a separate module like RECAP? Overall: We have been using RetailEdge since 1996ish and we've found it to be simply the best for our modest retail operation. It does everything we need it to do and the guys in tech support have been super helpful (when needed) to keep us up and running. We have been using RE since 2007 and have been very happy overall. Pros: The affordability is nice, compared to others that I've shopped around for. We purchased our setup in 2007 and we have since added to it, and have a total of three key FOB's (2 machines, 1 backup) for our business. I can operate the system in my sleep because I'm familiar w/ it, which makes it very hard to consider changing to another system. After digging into the features I was looking for, I found that with a modest purchase, RE can do everything that I want and need it to do. Cons: I have asked for some features over the years that seem simple and would be useful for the wide variety of customers as well. However, I think my biggest dislike is the inability to get a beep when a negative item is scanned and we're not looking at the screen. Example: We sell canned cat foods, and often times, we sell 24-72 of them at a time. Most of these cans have to be scanned at least once. Errors happen, and if our inventory is off or the items have arrived before being put in, there will be a negative. If you aren't looking at the screen, you'll simply not see the "are you sure" notification, which another scan of a can hits "ok"
We have trained ourself for the most part, but it would still be nice to have an alert. Overall: It's an effective way for us to manage our inventory and reports with out a high cost. I do wish there were a userface update to be more "modern" and the ability to look up customers who haven't been here since, say, 2015. More in depth reporting can be beneficial as well. Retail Edge has been a great, stable tool for POS. Pros: Retail Edge is very inexpensive for what it offers. Navigation is simple and day to day tasks are easily done using the tools included with Retail Edge. Items can be entered 'on the fly' yet inventory tracking is also done without needing to purchase a separate module. Customer tracking is also easily handled and reports are easily accessible. Using the matrix to handle similar items with differences like color and size makes inventory entry much faster and efficient. Retail Edge links seamlessly with our online store and keeps inventory control efficient across both channels. Cons: Designing a software to meet every retailers needs can be challenging. At times we have found Retail Edge to be cumbersome i.e. editing items after the fact can be difficult and can be accomplished, but not before doing multiple steps to make the corrections. We are a bike and ski shop and have a service department which we are unable to track the items in for service using Retail Edge. We have of course found a 'work around' as is with the case on most cumbersome features of the program, but having to create a work around is the cumbersome point. It has not been enough of a headache to leave the Retail Edge family, we have just needed to be creative in the 23 years we have been using the program. Overall: Inventory Tracking, Customer Tracking and day to day register sales. Great point of sale software with an amazing support team. Fifteen years of business and very happy! Pros: RetailEdge has a very easy to learn and use interface that is capable of doing anything we have needed or thought about needing for our retail store and paintball playing fields. Everything from gift cards, layaway, house charges, multiple clerks with security options, multiple locations, inventory, PO's, integrated credit card processing, customer management, great reporting, barcodes/UPC, 3rd party integrations for online sales, and more! You name it, RetailEdge pretty much integrates it into their program. We also subscribe to their gold level service plan which includes regular updates and priority call in help which is rarely needed but a great peace of mind in case we do need assistance. Their tech support is all in house in America so they are easy to work with and don't rush you off the phone. We have always had courteous professional service when needing support or asking questions. They have also built us some custom software to help RetailEdge integrate with some online marketplace needs that we had prior to releasing it to the public. After 15+ years of doing business with RetailEdge they continue to do a great job, offer great service, and keep updating the program to make it better year after year. We couldn't ask for much more! New to the retail environment, starting your own brick & mortar store.... this software is for you! Pros: As we continue to expand and grow our new business, we are amazed at all the functionality that this software has built in right out of the box. There have been several instances were we have decided to add a new twist to how we run the store, and as we search the Retail Edge manual, there it is! (Example : Gift Cards) This software has every possible option we want, even ones we haven't thought of using yet. We love that all the functionality you need is included in the price, no extra expensive modules to add after the fact. The mobile apps for sales updates are also very much appreciated. Cons: If there was one thing we could say in the negative (and that is really hard to do), we wish the "operating screens" were a little more fancy in layout and color selection. Maybe an option to customize the screens with some custom colors and a logo here and there. We know that is hard to do and still insure that the software runs on almost every piece of hardware that various customers own, so we will give Retail Edge a pass on that. Overall: This software gives us great reporting features and allows us to fully understand our growing business on daily, weekly and monthly basis. The ability to do back-office work on the main database without extra licenses is also a plus. Inventory management is second to none compared to other software we have seen. Flexible: Can be as complicated or as simple of a system that you want. Pros: There are actually a lot of features that I like about this program. The program is "forgiving". If you make a mistake, there are lots of options for fixing your error. Voiding and reissuing a transaction is easy. You can merge items or customers if you accidentally set them up two different ways. Also, you can use one UPC for many items using their alias feature. So, say you have a bunch of "eaches" - you only have one of that item, but you want to scan the UPC but you don't want to clog up your inventory with all of those one time items, you can add each UPC as an alias and when you scan that UPC, they are all under the same item. To accept the "exact balance", you can just hit "+" in the payment field and it will take it as the full amount instead of having to type in the amount paid. Cons: They took away the columns for quantity and last action date in Inventory list (unless you export). So, if you pull up the inventory list, you'd have to look at each one individually to see the quantity in stock instead of it being a column you can just view. Pros: Simple yet powerful. Great support. Online forum is excellent for getting questions answered or to learn a new skill. Fantastic reports and even more functions I have yet to try out. I love how there isn't a huge monthly monetary commitment and that the software does exactly what I need it to do. You really can't go wrong. It was the best decision I made. The gentleman who runs Rings n Things recommended it and I am so glad I went with his recommendation. It is scary to put all your inventory onto one system. I started with a small store and now we are filled to the brim. I am very confident with the software and am looking forward to doing more with it when I can find the time to play with it. I am happy to talk to anyone who has any questions. Cons: My online store and inventory are not directly connected. The printers can be a pain but that is more of a printer issue not a software issue. Also things are wonky with only one USB on most new computers. Again, the printers don't want to play nice all the time. Pros: I like how easy it is to get started using the software. I can keep track of basic info about my inventory and it has helped us grow our company from a startup to 2 locations. I like how easy it is to make reports and it does what we need it to do keep track of Lay-ways and special orders. This software is better then others out in the market even if it has less fancy reports it still gets the job done for our store. Cons: I least like the lack of being able to keep a printer online with out it going in to sleep mode. I was told it was not a Retail Edge problem that windows was causing it but I have gotten used to my printer not working until I disconnect it and have to re-connect it to get it to print. Overall: I am a believer in this brand constantly being updated to increase our needs. Customer support has been awesome all the time I have no overall complaints about this software. Has been great for my shop! Every week I discover another function or report that makes life easier. Pros: Ease of use of the basic register and inventory functions so that you can use it immediately upon set up, but then you can learn more as you go. I love the reliable and friendly tech services. I also like being able to order supplies and get them so quickly. I love the Sales Manager function with which I can look at what has sold on the day, click on the item which brings me the to inventory screen to see the current inventory after the sale. For a many faceted, one person operation, it makes reordering a snap and saves me much time. I like the ability to have wish lists for customers! Cons: There are so many report variations available, that it would be nice to have some standard reports where the user doesn't have to choose options except for the date range. Overall: The ability to easily track my inventory, sales, and sales tax. I Love This Retail Solution!!!! Pros: GREAT free customer support over email. Frequent updates. VERY Flexible. AFFORDABLE purchase price and updates. Rock solid performance. Great under the hood abilities. Without a doubt, the most feature rich and the most affordably priced retail pos with an incredible and responsive team. Recently improved support for integrated cloud, network, e-commerce. Runs very well on Windows 7. Cons: Not the MOST appealing visually. Some features are buried or structurally antiquated. Good (not great) reports, templates (no ability to edit template for reports receipts). Sales/discount rules are one of the elements that are feature rich, but tricky to set up. Not as intuitive as they could be. For some, (not me) it might be a con that it doesn't run on an iPad. Overall: Peace of mind, easy backups, control over inventory, solid reporting. Very easy to use and straight forward. Does everything I need for my store and more. Pros: Easy to use and easy to teach new employees. Adding inventory is fast as well as grabbing reports. Cons: Wish there was a Buy 1 Get 1 Feature for the discount. Feel like the customer information retention gets deleted after so long. Overall: an well made-smooth checkout for my customers and employees. David, Thanks for your review! We're so glad you like the ease of use and our comprehensive reporting features. We do have a Buy X for Y and get Z off feature! please click Here to go to our forums for a step-by-step tutorial on how to set it up. Give us a call if you have any questions! Regarding your customer information, nothing should be getting deleted since your data is local to your own computer. If you are concerned you're losing data please give Tech Support a call. We've been using Retail Edge for over 5 years now and we are satisfied with the product! 1. Inventory capabilities. 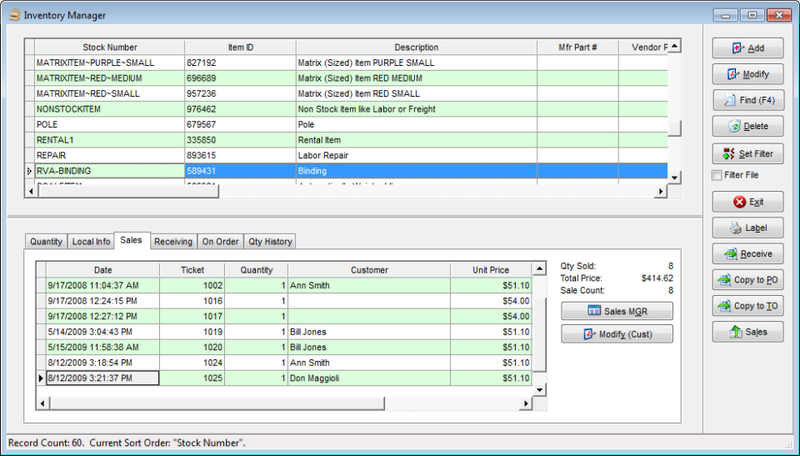 Being able to run purchase orders based on previous sales within a specified date range is a big help. 2. Stability. The software has been fairly stable . There haven't been any major errors that disrupt any daily activities. If anything comes up, the tech support would typically come out with an update shortly after. 3. Tech Support. The tech support group has been very helpful with any issues we may have. For initial installation, they guided us via remote login and made things very easy. Cons: I described a couple issues that we've had to the Tech Support group. 1. Currently, we have to use the exempt rule feature to apply discounts to items which are already part of a discount class. Pros: It is hard to pick one thing! It was so perfect for my boutique. But if I have to pick one thing, it would have to be ease of use. I was able to figure everything out without help-although they are readily available if you need assistance, and could train my employees on the system myself. Cons: Since it provided everything I needed, and was so flexible in application, there isn't much I don't like. My store is unique in that I sell some custom items (curtains for example) that are made up of various items purchased and sold as a single unit. This is a bit cumbersome but manageable. Overall: The software does everything! 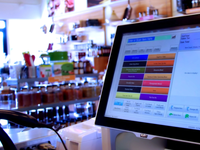 It provides a flexible and user friendly POS that fits my business. It is affordable, secure, provides numerous reports and has the best support service you will find. Seriously, the best retail program out there. Pros: Easy to use tools and my data belongs to me. I don't have to be connected to access my data. I can work in an offline mode and then synch up later. The other big thing was credit card processing and I had a choice when it came to this unlike other companies where they only give you one option. Overall: I was looking for a Point of Sale Software to run my sporting goods store and the reason I chose RetailEdge was because they were the only system that I found where I could just buy it outright and not get hit with all sorts of subscription fees. The other reason I chose them was because the data was mine and it was not sitting up on someone's cloud having who knows what analyze it and mining my information. The support team is knowledgable and has ben able to help me through the small issues that all seem to be related to Windows Updates messing up printers. All in all its a good program at a good price. 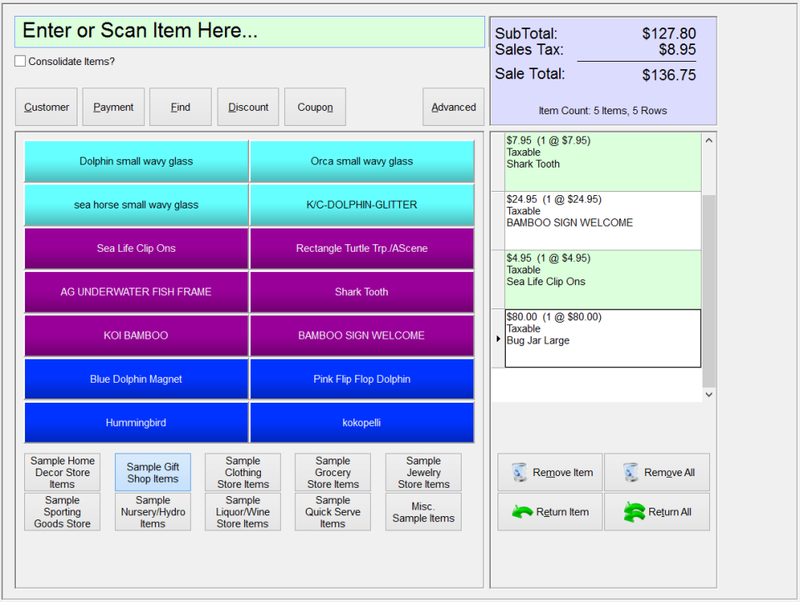 Amazing POS software for a fraction of the cost of others on the market! Pros: This software is amazing. My small business couldn't afford some of the higher priced POS systems that are out there. After using the demo version of Retail Edge, I was sold! It does everything I need it to and more...excellent reporting, inventory tracking, functionality...and the customer service is amazing!! I don't have to use tech support often, but the few times I have, they have been quick to return my call and even quicker to solve the issue and are very pleasant to deal with. I've had Retail Edge for both of my stores for almost 2 years now and am still loving the software. I love that it has an "Island" option where I can use my laptop to work from home and it will sync to the store. We can also use it as a second register during the busy days. The "Dashboard" app allows me to check the store sales (both locations) throughout the day, which is also nice. Pros: Most tasks can be done on the keyboard. Using a mouse slows me down on completing a transaction and we don't have touch screens, so being able to use the keyboard and hot kets, etc, is SO helpful! I've used this program for about 15 years and it's a great product at a great value. Their service is good and you get to "know" the people at the company, even though they are based on the other side of the country from me. Cons: When looking at inventory, have to go to several different tabs to see 1) quantity in stock, 2) price that they last sold at and how many, etc. And quantity in stock is no longer a column that you can see at a glance on the inventory screen. Overall: Great inventory control and helps me to decide how/what/how many to reorder. Simple program that can do everything that I need it to do. Pros: I like how this program keeps up with all aspects of inventory, sales and customers. Basically, I can do any type of analysis that big box retailers do using this software. Cons: I least like the support for this program. I consider myself an expert user at this point, and I find it frustrating that I am charged regardless of the outcomes of my support calls. I've had many issues that the support staff couldn't fix that I've figured out, but I was still charged when they logged into my computer without fixing anything. There was also a blame game played saying that it was the other piece of software that wasn't working while I need multiple companies' software to work in unison. Overall: I use it every day to track the sales and inventory of my stores. We have been using RE for a long time. It is perfect for a small retail business. Pros: It is easy to use and is awesome for managing inventory. The reporting functionality is very helpful for ordering and deciding what inventory should be discontinued or reordered. Great program for multiple locations as it is easy to see what inventory each store has so you can satisfy a customer right away with knowing we can transfer the item right away. Cons: Two things: I would like to see the loyalty dollar part of the program a little more user friendly. Most loyalty programs accumulate in real time vs. having to batch. The other thing is having to select a payment method for gift cards before scanning the card. It would be easier if you scanned the card before the payment screen. Retail Edge was a solution that allowed us a robust, feature rich system with a low entry cost. Pros: We love that we were able to use a lot of our own hardware, we can run remotely offline with their Island system and have multiple locations. Our budget was small, but the system affordable and delivered on our needs. We like that we can talk to someone and our Gold Support Plan allows us access to technicians when we need it. Cons: Some types of transactions are a little restrictive, however, it may be our own lack of knowledge. We continue to learn about the software and new ways to do things. Sometimes we are just too busy to learn more about it. To this end some additional webinars would be helpful routinely where we could get some online training and ask specific questions. Retail Edge is so easy to set up and use, and if I ever have a problem, the reps are super helpful! Pros: I like the interface between Retail Edge and my credit card system. I don't have to enter the amount twice, which prevents errors in charge amounts. Cons: When an old record is deleted, sometimes you can't re-use the stock number or it warns of a duplicate entry. If I deleted it, it shouldn't be there at all! Overall: I can track my stock, issue Gift Certificates...thinking about it, we have 2 locations and we don't utilize a way to be able to track gift certificate sales over both registers. It would be nice to be able to accept our other location's GCs without having to go in and adjust the sales later. I don't know if that can be done or not. Started RetailEdge in 2013 . Quickly proved to be faster, easier & 1/5 the cost of POS used before. Pros: Pre-made Reports export to excel with 1 click. The customer loyalty program alone is worth the price of the program. The stand alone laptop workstations let me work anywhere. The support is personable, quick and detailed. Cons: Some of the reports I use the most require extra steps to create. There is a nice feature which gives you extra "custom" database fields for inventory and customers - but you cannot change the generic labels - which makes it hard to keep consistent across multiple users. Overall: Saves money, makes money, saves time analyzing and ordering products. Cons: RetailEdge is complex to use for a newbie. One will have to study the help files (which was fantastically prepared and exhaustive in detail) very well in order to grasp the understanding of its intricate use. But once that is done, it will be easy all the way. Overall: It has been very useful to the company in managing its various outlets within the city. And printing receipt and keeping inventory has been much easier since the purchase of RetailEdge. Pros: No monthly fees. Powerful yet simple. Cons: Didn't work with the shopping cart on Weebly. Not able to have Loyalty dollars instantly apply. Overall: Great. Excellent customer service and a great well priced product. I don't know what else you could ask for. I liked paying upfront and having minimal monthly fees. Most other companies have little to no up front costs but then their monthly fees are ridiculous. I plan on being in business a long time so this made the most sense to me. Maybe if you aren't sure if you'll be around in 5 years this wouldn't be for you but otherwise you will be saving a TON of money. Pros: Easy to set up & use daily. New employees learn quickly. It is all around a great POS system for any type of business. Cons: Customer search defaults to ID. Layout of customer manager takes time to navigate through. Requires a few more steps in processing a swiped credit card than I would like but probably more of a cc processor issue and not the Retail Edge software. Overall: Easy to use and train new employees. Upfront cost are very reasonable and monthly cost is well worth it and affordable. Best POS system I have used for everyday sales and customer billing. State sales and use audit was flawless per the auditor . Pros: Ease of use, great tool for inventory and customer purchase history. Love the reports. We love it and wouldn't change anything. Thanks so much for your review! We're glad you like the reports and and customer purchase history. Our Upgrade plan is only $5/workstation/month, and at 9-10 updates per year, we feel that amount best suits our customers and our efforts to provide the best version of RetailEdge we can. Best bang for your buck, no doubt. Excellent support During implementation. Pros: The price point was unbelievable. Best value on the market, no doubt. Support during implementation was excellent. Everyone in tech support was always friendly. Customizing our price tag labels & receipts was greatly appreciated. Direct integration with credit card processing. The last thing I wanted was to give our customers 2 receipts (sales & CC receipts). The integration works seamlessly. Cons: All complaints are minor, and relatively insignificant. Inventory Manager & Recieving seems like redundant functions and can cause some confusion. Search functions in Recieving has limited function. Search functions always revers to default search category rather that keeping last search preferences. I still haven't figured out how to label display discounts the way I want to. Pros: This software has the functionality of a much more expensive package. It is reliable and flexible enough to meet all of my demands - from inventory management to ringing up sales at trade shows, I have not found a product that can compare. Cons: Direct access to the database is difficult for DIYers like myself. I would also like to see editable grids introduced on the purchase order screens to allow quantity adjustments without having to run through 3 screens for each item. Awesome is the word I would use. Pros: It's user-friendly and has many layers so there is always some report that you can create or you can detail and customize your inventory. Minimal training when you hire new or seasonal staff. RetsilEdge's staff is very professional (I can probably name every one of them from all the help they've given me over the years and knowledgeable, they are all great! Cons: Nothing really; As I mentioned before, it's user-friendly and can be used easily. Nothing to complain about. Pros: Easy to use. App is helpful. Service is great. The Island functionality is very helpful, as is the ability to hardwire and network. We run two PCs and a laptop that sometimes serves as a register and all three communicate well. Cons: The reporting is not great. Basic sales etc is fine, or if you just want to see PDFs, it's ok, but the two ways you can export to excel are not great if you need to manipulate the data. Hard to sort, lots of repetitive page break info etc. From day 1 (almost 15 years ago)been so helpful! Rarely need help when I do they are great! Pros: Easy to learn, provides data I need to make good decisions for my business. Turn key set up and support. Cons: Having to modify the price to reprint a price label with the original price on it. We do markdowns in red pen from original prices. Never need the sale price printed on a label. Would be nice to be able to reprint labels always at original price. Now look up item, change price back to original, print label, change price to sale price. We have used Retail Edge for 20 years. It has always worked well for us. Pros: Customer Support is incredible, when you call in you get real people who understand the product and can solve your problem in a few minutes or less. The new Android Dashboard so I can stay in tough with my store sales. Cons: When Microsoft does its updates there are often small issues that crop up and make something in Retail Edge malfunction. But the good news is that Customer Support is awesome! Overall: We can track customer history, product sales and see trends in the paddlesports industry. Cons: You must move within the framework provided. If you want to do something not supported it can be a difficult road. Overall: Fairly bulletproof Point of Sale (POS) application. Pros: Easy and inexpensive. Over 135 reports. Easy to search current inventory. Easy to teach employees. Cons: Should have reports other than a sales report that generate manufacturer or vendor part numbers. Hard to integrate with some of our manufacturers reports. Have to manipulate excel sheets which is too cumbersome. Would like the sizes listed horizontal instead of vertically. Kind of like a size sheet where you make scores. Pros: This software is able to handle the 14000+ clients we already have. The import process was easy. It handles the variety of inventory all the way down to serial numbers. Cons: The only real complaint I have with this software is when receiving check payments from customers there is no field to enter the actual check number. Many times months down the road a customer will call and ask for the check number an invoice was paid with. 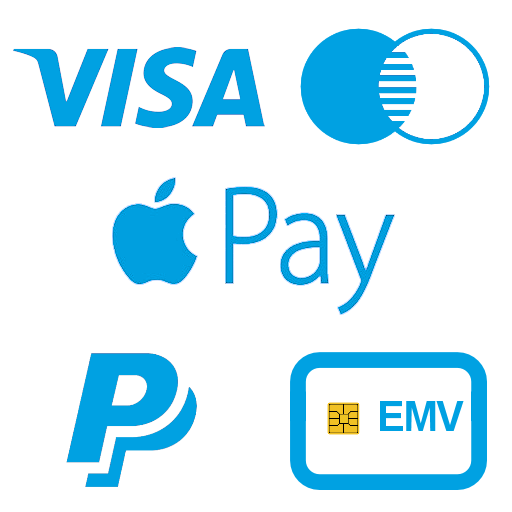 Overall: I am able to use the new chip credit cards and it is very professional interface when we have credit card machines that interact with our software. Customer history and inventory management. New to R.E. in June. Very easy transition. Pros: The intuitiveness of the tasks. It guides you to success. We like the multi-options to perform tasks. You can do it this way or that and still be successful. Very easy to train folks to use the system. Support was there and very helpful when needed. Cons: The least favorable pre-purchase issue was the anxiety in setting up and learning a new POS system. I didn't look forward to the anticipated time needed to learn and launch the program. It was easy ! The anxiety was totally unwarranted and the time requirements were well below the hours I expected. So much of it was intuitive and reasonably understood. Overall: Quick, easy and comprehensive transition from a POS system we had been using for 20+ years to Retail Edge's product. Still learning (only been on-board for 2 months), but any avenue I take to become savvy with an unexplored area meets with quick and comprehensive understanding. It's remarkable intuitive. The options to perform tasks make sense and the performance is easy. Simple to use, great value, does everything needed. Pros: Great customer service. Easy to use functions. I like the retail island, I can check my sales remotely. Cons: When looking up a customer, if the customer isn't in the system you need to start over again. ie; What is your name...my name is Philips...you look up Philips and he's not there...it should then say do you want to make Philips a customer, rather than making us retype Philips...which is an easy last name . Pros: I like the robust data collection - that it has so many fields - and that I can import from and export to a CSV file. Cons: I would like to see more flexibility to use the data - for example, ability to sort and organize fields on a page and keep that layout, ability to filter and sort by multiple levels, and ability to create customized reports. Overall: Data collection, retrieval and analysis. Easy reports for sales tax and accounting. Being a customer for 14 years I think says it all. Great product and even better support!! Pros: Perfect for my small retail business. Having two stores it tracks our inventory and simplifies the ordering process for the two stores. It is a user friendly piece of software and if you don't understand anything, the RE Tech staff is there for you! Cons: I wish it was available for a Mac platform as I am not a fan of windows. When windows updates is the time we have trouble and need tech support. Pros: The ease of use of all aspects of the software, very easy for sales clerks as well as for the administrator for system setup and creating item codes, departments, classes, etc. Cons: I have a specific/unique application that the software doesn't do. However Sales/Customer service provided me with 2 workarounds and an explanation. Pros: As a used bookstore we have utilized the customer features to track book credits. This allows us to see when our customers were last in and contact info to get them back! Simple and easy to use!! Pros: It has the ability to give me the information I need. the scanner is a great feature. The ability to pick and choose the equipment was nice. Cons: You have to wade through way too much to get to what is needed. The ease of use is minimal. Functionality for the daily user as a cash register is too slow. Judy, thank you for taking the time to give us your honest feedback. We are very sorry to hear you're having a difficult time using RetailEdge, as our Technical Support agents pride themselves on exceptional service and training. Someone will be reaching out to you shortly in order to gather more information about the issues you're having and offer ways to make the program more functional for you and your business. Thanks again. 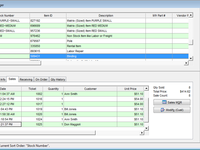 Very good standalone software suite for managing sales and inventory for a retail store. Pros: The software is easy to use and very intuitive. Loading inventory is pretty straight forward. Because it is windows based we can run it on any computer that fits our needs. Currently we are using a surface tablet with a generic Bluetooth barcode scanner, receipt printer, label printer, and cash drawer. Initial setup for accepting credit cards was quite easy with the assistance of customer service. The software has a very robust reporting system that help in day to day management and simplifies the accountant's efforts. Cons: Becuase the software package is so comprehensive, it can take some time to complete the initial setup. Overall: It is invaluable for our business. Pros: all of the reports are easy to use and customize. customer contact has all you could use to keep track of customers. Cons: inventory search. that being said it may be the way we have ours set up and could be used a different way to make it more efficient. Overall: the ease of viewing from any computer, not just the point of sale computer. customer info is easy to access and set up. the reports are very easy to customize. Have been using it to receive merchandise and as POS system for many years. 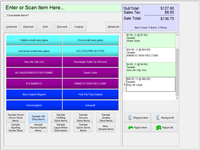 Pros: Ease of use, receiving merchandise and inputting POs is easy and user friendly. We've been approached to change our software system many times over the years, and no one has convinced us that they'd be better or easier to use than Retail Edge. 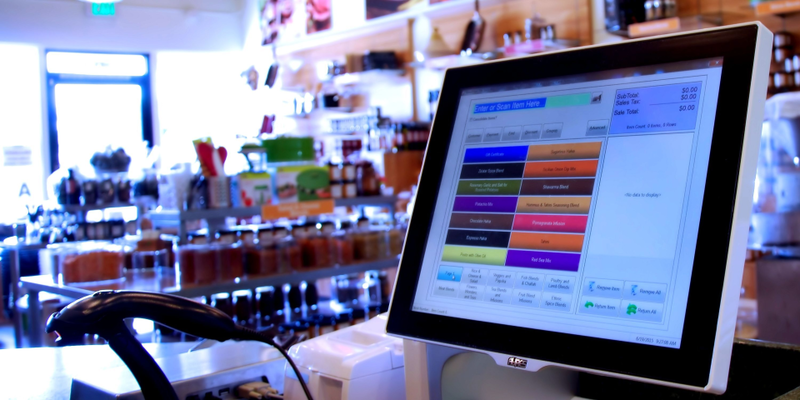 We use Retail Edge on a daily basis as our primary POS software. We use the software extensively. Pros: With this software glitches are rare. We only need to call customer service about once per year and they are always super friendly and are able to access the computer remotely to help fix things. Cons: Layaways that have been finalized have too many transactions listed in the sales manager. Once completed it should be one receipt showing all payments.